On february 6th 2015 Bob Marley, the King of Reggae would have celebrated his 70th earthday. We remember him for changing the world with his unique and powerful music & message. More than a good reason to produce a T-Shirt in that spirit. Yet we didn’t want to make another red, gold & green design with the usual reggae symbols. 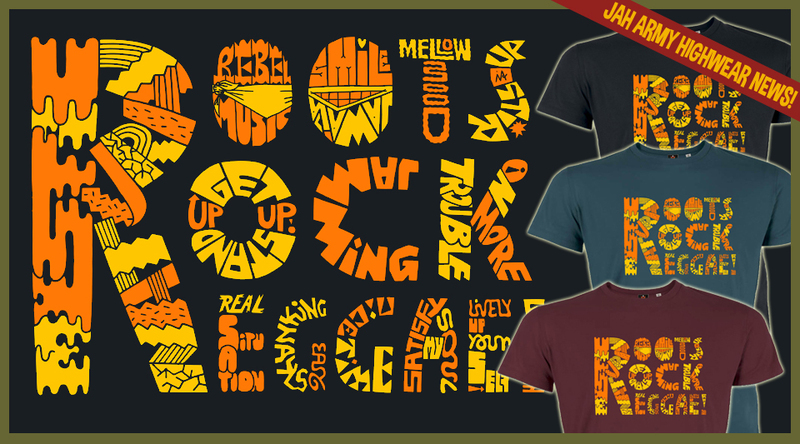 So we asked Kid Gringo – the best designer we could imagine for such a task – and this is the result: A 100% handdrawn design, each letter formed out of a Bob Marley songtitle and displaying the essence of ROOTS, ROCK, REGGAE! This design is paying a tribute to the past, while standing in the present and looking forward to the future of ROOTS ROCK REGGAE! This is a limited edition of 99 pieces worldwide which means there are only 33 copies of each colour! 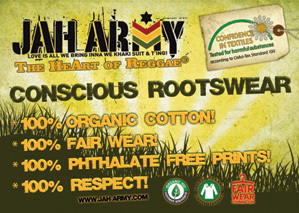 All Jah Army organic T-shirts are GOTS & Fairwear certified!